Born on 28 May 1940 in Bazar Beria village in the South 24 Parganas district of West Bengal, master puppeteer Prafulla Karmakar was initiated into puppetry by his father Kishori Mohan Karmakar. He has attained a rare mastery over all aspects of the art of Dange’r Putul, the traditional rod puppet of West Bengal. This extends beyond performance into designing and making puppets as well as creating new Palas or scripts for puppet plays. His plays are mainly based on the Ramayana and Mahabharata, from which he extracts new episodes for his drama. His popular productions include Purushottam, Pashaner Maya, Ponmukti, Datakarna, Chandrahas, Sonai Dighi, Horka Chandra and Sati Behula. 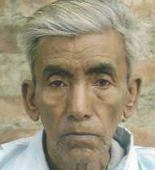 Besides shows in the Bengal countryside, his performances have been witnessed at the Tradional Puppet Festival in Ranaghat (1990) organized by the Department of Information and Cultural Affairs, West Bengal and at the National Puppet Festival 1997) in Diamond Harbour, jointly organized by Sangeet Natak Akademi and the Folk and Tribal Cultural Centre, West Bengal. He has performed at Visva Bharati, Santiniketan, on the occasion of the 124th birth anniversary of Rabindranath Tagore (1993) and at the Banipur Lok Utsab in Banipur, Habra (2013). Prafulla has also performed in several States in North-East India. He has shared his experience at workshops on Dange’r Putul held in the State, such as those organized by the Information and Cultural Affairs Department, West Bengal (1987, 1990, 1992) at Ranaghat and Bagula, and the rod puppetry workshop organized by the Kalabarata Somiti (1992). Prafulla won the prestigious Sangeet Natak Akademi award for 2012 on May 28, 2013, along with a cheque for Rs 1 lakh, for his contribution to the traditional puppetry – Dange’r putul of West Bengal. He was till recently the Director of the Kalimata Putul Nach Party, a long established puppet theatre group of West Bengal. But ailing, at 75, he has handed over the reins to his son, Tapas Karmakar.